A guide to the funders, think tanks, lawyers, and politicians behind harsh Arizona-style legislation. The anti-immigration movement has come out swinging in the past several years, writing and proposing hundreds of restrictive state-level bills and berating a president who has deported more than a million people for not being tough enough. During this year’s Republican presidential debates, candidates have peppered their arguments with plans for double-layer border fences, the theory of self-deportation, and even praise for Arizona’s immigration crackdown. This should come as no surprise, given the myriad connections among border hawk politicians, pundits, advocacy groups, PACs, foundations, and legal advisers. 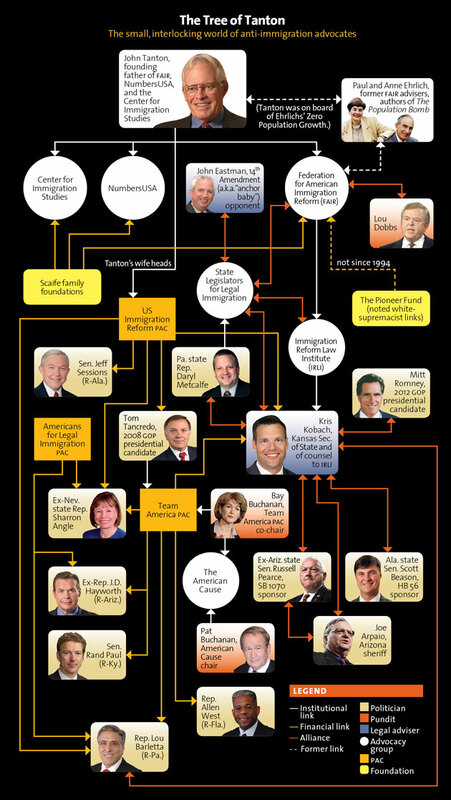 Just below, see all those links—family-tree style. And then scroll (or jump) down to see more an in-depth analysis on the clusters that surround John Tanton | Kris Kobach | Daryl Metcalfe | PAC Funding. An eye surgeon and conservationist from northern Michigan whose concerns about overpopulation led him to take a stand against what he calls “mass immigration,” John Tanton started the Federation for American Immigration Reform in 1979 and later went on to help fund the creation of the Center for Immigration Studies and NumbersUSA. Those three groups, along with the FAIR-related Immigration Reform Law Institute, have been among the strongest anti-immigration voices in Washington over the past two decades. 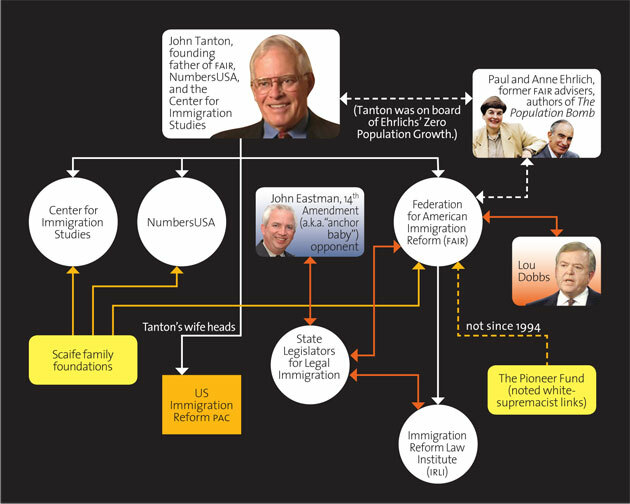 Even with the success of his groups and their various affiliates—fueled by millions of dollars worth of donations from the Scaife family foundations—Tanton’s associations with white-supremacist and nativist groups (including FAIR’s past financial support from the Pioneer Fund) have led some former colleagues to distance themselves from the septuagenarian retiree. 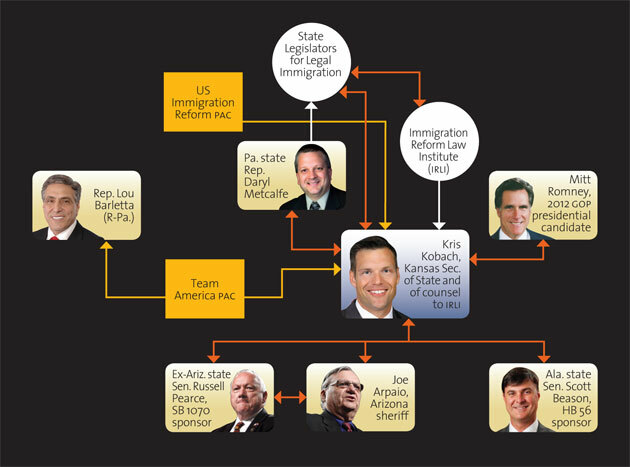 As the man behind the self-deportation movement, it’s no surprise that Kris Kobach is a key anti-immigration connector. (Check out Suzy Khimm’s profile here.) After all, he’s worked with key state legislators, like Alabama state Sen. Scott Beason, and municipal authorities, like notorious Arizona sheriff Joe Arpaio, in drafting and polishing dozens of restrictive immigration laws. (He says he even wrote parts of Alabama’s HB 56 while in a turkey blind.) As a 2004 congressional candidate, Kobach received campaign contributions from Tanton’s wife’s US Immigration Reform PAC and former Colorado Rep. Tom Tancredo’s Team America PAC. Currently Kansas’ secretary of state, the 45-year-old Kobach—referred to by MoJo contributing writer Jack Hitt as “ruggedly handsome in a TV superhero rip-off-his-shirt sort of way” on a January episode of This American Life—has struggled to gain support for an Alabama-like law in the Sunflower State. Started in 2007 by Pennsylvania state Rep. Daryl Metcalfe, State Legislators for Legal Immigration works to eliminate “all economic attractions and incentives (including, but not limited to: public benefits, welfare, education and employment opportunities) for illegal aliens, as well as securing our borders against unlawful invasion.” The group most notably has pushed for a Supreme Court ruling on the 14th Amendment, which the SLLI believes shouldn’t grant citizenship to the US-born children of undocumented immigrants; it also has teamed with the FAIR-aligned Immigration Reform Law Institute to draft legislation ending such birthright citizenship. Metcalfe hasn’t shied away from controversy, often referring to the “illegal alien invasion” facing the country and filing an amicus brief (PDF) in support of Arizona’s SB 1070. 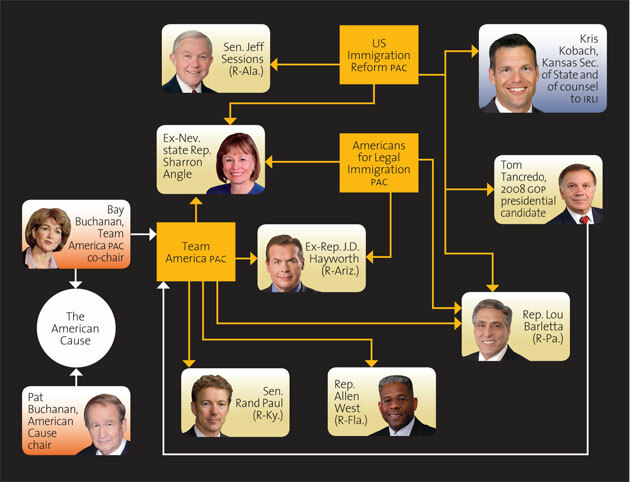 Of the SLLI’s 68 members, 15 sponsored copycat legislation in 2010 or 2011. Americans for Legal Immigration PAC has contributed to a who’s who of immigration hardliners, from Rep. J.D. Hayworth (R-Ariz.) to Rep. Lou Barletta (R-Pa.). Team America, founded by Tancredo and co-chaired by Bay Buchanan (Pat’s sis), has pumped more than $100,000 into House and Senate races since 2004. Want more data? Check out our one-of-a-kind database, the most comprehensive roundup of state immigration laws publicly available.